The cochlea, the mammalian auditory organ, is a spiral-shaped structure in the inner ear that is responsible for hearing. It converts sound vibrations into electrical signals and sends them to the brain with a remarkable temporal precision. Defects in the cellular or molecular components of the cochlea can lead to deafness and other hearing impairments. 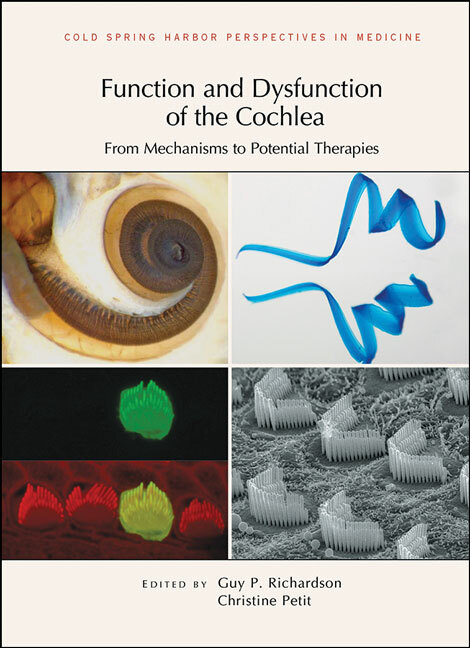 Written and edited by experts in the field, this collection from Cold Spring Harbor Perspectives in Medicine provides a comprehensive review of the complex molecular mechanisms that are responsible for cochlear function and were, for the most part, revealed by the discovery of genes responsible for hearing impairment. It describes major advances in our understanding of the pathogenic processes underlying various forms of hearing loss and the emergence of treatments for deafness. The contributors focus on the highly specialized cells which mediate auditory transduction—the hair cells—and their unique architectural, mechanical, and molecular characteristics. They also consider the properties of other cochlear components, including the tectorial membrane, the synaptic connections with auditory neurons, and the resident macrophages, as well as the development and evolution of the cochlea as a whole. Topics such as hair cell regeneration, otoacoustic emissions, and ototoxicity are also discussed. In addition, the authors examine the epidemiology of hearing loss and emerging, innovative, therapeutic strategies (e.g., gene therapy, optical cochlear implants). This volume is therefore a valuable reference for cell biologists and neuroscientists interested in the biology of hearing, as well as physicianâ€“scientists seeking new approaches to alleviate hearing impairments. Stem Cells and the Bird Cochlea—Where Is Everybody?